Lovely…and you’re right to be proud of those points. How annoying on the feet! Oh well, at least now you have a spare. I really like this block. Yes, getting those points all matched up in the centre – I can imagine how taxing that is. Love the colors and the pattern! I am impressed with how perfectly aligned it is. I can’t keep my shapes straight at all. Thank you! My 1/4 inch foot definitely worked its magic! Pingback: Vintage post: The Wing Collar Blouse | ooobop! 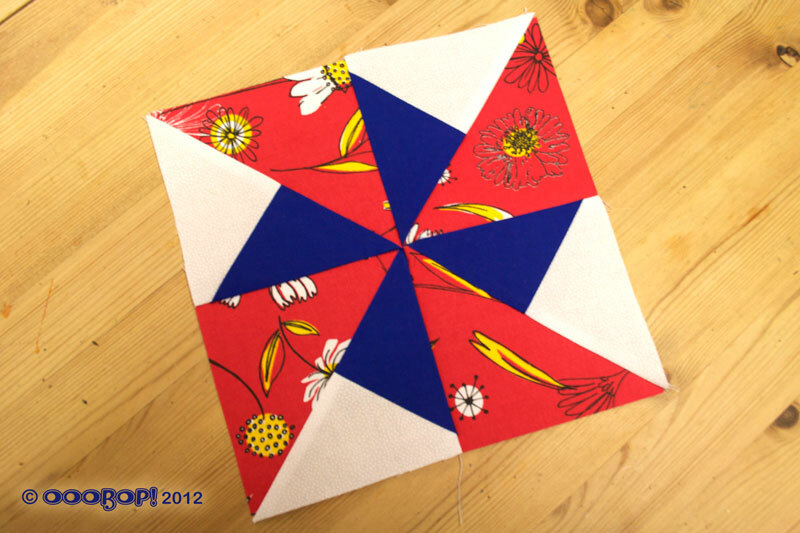 Pingback: The Trafalgar quilt block | ooobop! Pingback: The Chequer Square quilt block | ooobop! Pingback: The Diamond Square block | ooobop! Pingback: The Cactus Pot block | ooobop! Pingback: The Sawtooth Star block | ooobop!